Huge Savings Item! Free Shipping Included! 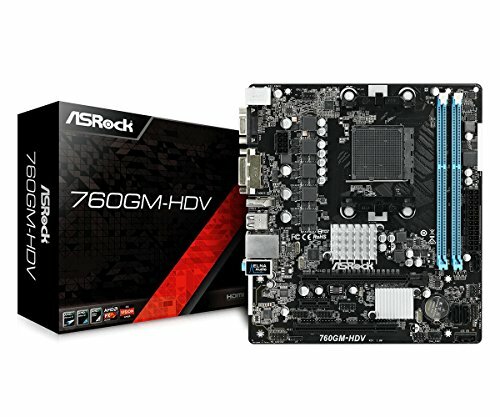 Save 12% on the ASRock 760GM-HDV Socket AM3+/AM3/ AMD 760G/ DDR3/ SATA2&USB2.0/ A&V&GbE/MicroATX Motherboard by ASRock at Andy Pemberton. MPN: 760GM-HDV. Hurry! Limited time offer. Offer valid only while supplies last. ASROCK 760GM-HDV Socket AM3+/AM3/AMD 760G/DDR3/SATA2&USB2.0/A&V&GbE/MicroATX Motherboard. CPU: Socket AM3+/AM3 Supports Socket AM3+ processors. ASROCK 760GM-HDV Socket AM3+/AM3/AMD 760G/DDR3/SATA2&USB2.0/A&V&GbE/MicroATX Motherboard. CPU: Socket AM3+/AM3 Supports Socket AM3+ processors. Supports Socket AM3 processors - AMD Phenom II X6/X4/X3/X2 (except 920/940)/Athlon II X4/X3/X2/Sempron processors. Supports 8-Core CPU. Supports AMD Overdrive with ACC feature (Advanced Clock Calibration). Supports CPU up to 125W. Supports AMD's Cool 'n' Quiet Technology. Supports Untied Overclocking Technology. Supports Hyper-Transport 3.0 (HT 3.0) Technology. Chipset: North Bridge AMD 760G & South Bridge AMD SB710. Memory: 2x DDR3-1800(OC)/1600(OC)/1333/1066 DIMM Slots, Dual Channel, non-ECC, un-buffered, Max Capacity of 32GB. Slots: 1x PCI-Express 2.0 x16 Slot, 1x PCI-Express 2.0 x1 Slot, 1x PCI Slot. SATA: 4x SATA2 Ports, Support RAID 0, 1, 10, JBOD. Audio: Realtek ALC887 7.1-Channel High Definition Audio CODEC. Video: Integrated AMD Radeon 3000 Graphics w/1GB Max Shared Memory. LAN: Realtek RTL8111H PCI-Express x1 Gigabit Ethernet Controller.